Newbie here. I'm just starting to collect tools/knowledge to put together an acoustic guitar. I started trying to learn to play (electric) about three years ago. 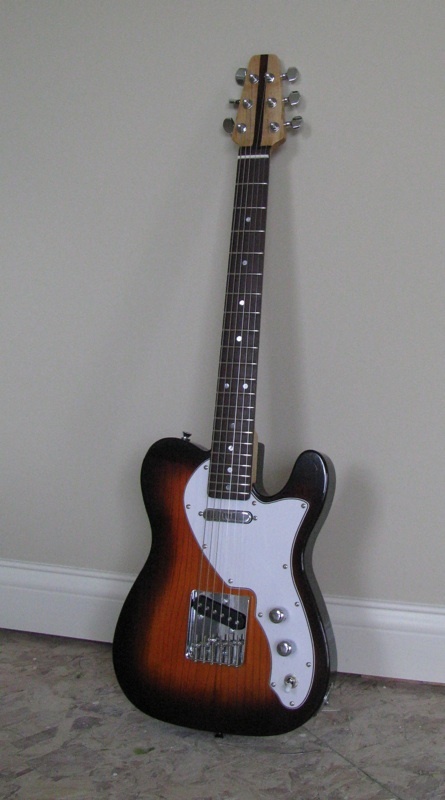 A couple months after buying my first electric, I started buying parts from Warmoth to put together a partscaster (Strat). That led to some kit builds, which led me to TDPRI (I'm "DesmoDog" over there) which led to building a couple electric guitars from scratch for their build challenges. A month or so ago the shop where I took lessons closed. When they were blowing out their inventory I bought a Martin D-1GT. I already had an Ibanez acoustic but never really bonded with it. The Martin is another story. The thing is, I had planned on buying an all mahagony Martin but they sold it before I got there. That led me to LMII and their kit wizard. That led to the idea of putting together a mahogany/saeple(sp?) kit some time this summer. I know mahogany may not be the best material for a complete newb but I'm kinda stubborn so there it is. In prep for that I've bought a couple guitar building books, I've forgotten the authors now (see cold medication, above) but they are two of the popular ones that get recommended in most searches. I've also started putting together a bending iron. I have it planned out but haven't gotten very far on the actual assembly. Pictures to follow when I've made more progress. Tomorrow an order from LMII is supposed to show up, a couple sets of practice sides, some cheapo top wood, and plans for a tenor uke since I have an attraction to smaller scale instruments. For the first 40 some years of my life I was into cars and a certain brand of Italian motorcycle. The vast majority of my experience is working with those sort of things. I've rebuilt a few bikes over the years. When I finally discovered guitars the bike projects slowed down quite a bit. I've accumulated a few woodworking tools due to my electric builds so I'm not completely new to this. My dad built banjos back in the 70s, early 80s under the Kenfield Banjo Works moniker. I ended up with some of his tools after he pased away but am kicking myself over some of the tools we gave away. I'm rebuying them now! So that's basically where I'm coming from. I doubt there will be much progress on any of this any time soon, I'm in no hurry to build this and am guessing ther will be a lot of delays as I realize I need a different tool or whatever. My first scratch build for the 2011 TDPRI challenge. The tuning was an idea I had that didn't work very well, that guitar is in pieces now. I have the parts to )I think) fix it but it'd probably be easier to start over. Welcome to the MIMForum Craig! Good work too! Welcome Craig. Good to have you on board.